And it's only one of several entrepreneurial efforts to make some green while people still feel HOPE. I also love the model we found of BHO's 757, a.k.a. Hope Force 1. And so does America. These were custom made by the exhibitor for QVC, where they apparently sold out all 2500 of the limited edition for $199 apiece in 30 minutes, according to the dude in the booth. Change, get it? CHAAAAANGE! With the financial crisis, this also takes on an added layer of irony. 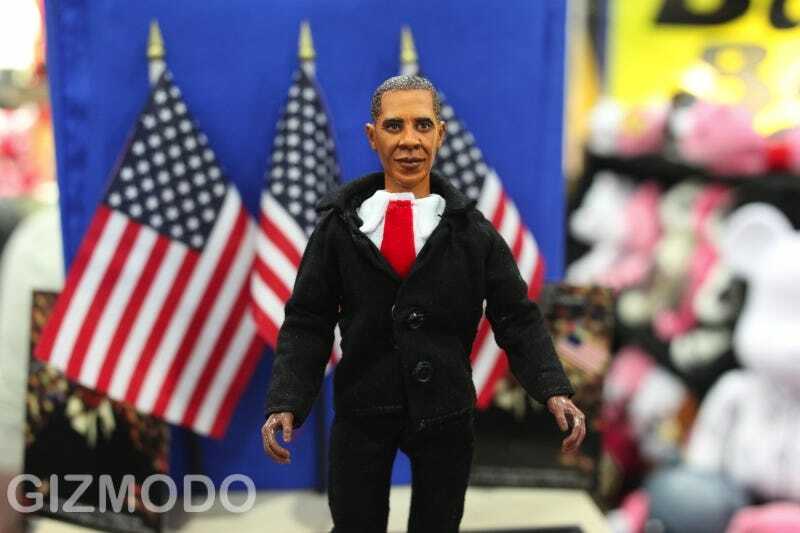 And this was probably my favorite Barack toy: The Obama Mania Game! You use Obamabucks to navigate the campaign trail, where you can land on spaces like "Gov. Palin Proves a Liability to Her Party: GO SIX SPACES AHEAD!"